I can’t express how much this meant to me…I guess, Morabito is to me what Anne Wintour would be to fashionistas. An exceptional woman with an amazing vision for simplicity and beauty and someone whose work and vision has influenced my life immensely and of course, the birth of BODIE and FOU. 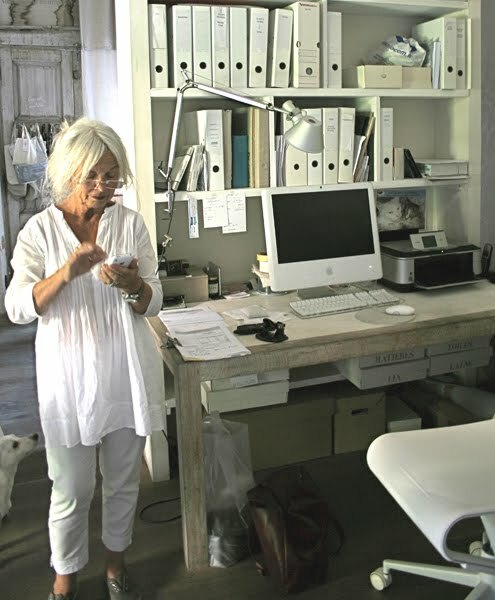 Nowadays, white interiors can be seen everywhere but Jacqueline Morabito was an Avant-gardiste in the way she created simple, flawless, understated yet welcoming contemporary white interiors and although often copied, her style is very unique. You won’t see shabby chic in Morabito’s work but rather a vision for purity and simplicity, which can also be found in the small decorative pieces she designs for the home. I remember the stab of pain I felt the first time I came across her home in a French magazine in my twenties… There it was, spread over a few pages, her amazing white, simple and achingly cool contemporary home. I never looked back and although my work at B&F introduced me to a lot of talented designers, Morabito is right up there, at the top as my Design icon. I spent a good hour in the shop, talking about her work as an Interior Designer, the objects she designs, taking photos and buying some beautiful gifts for Elodie and my mum and I was leaving… she arrived, beautiful, radiant and smiling. I introduced myself, she kindly invited me to sit in her office (can you spot my Clare Vivier Tropezienne bag? ), told me she knew about BODIE and FOU (honestly…this is mad!) and we talked about her work, about B&F, about what we could do together and all this time, while I was sitting in front of her, the only thing I felt doing was hugging her. I just wanted to hold her. She was so warm and welcoming, so passionate! She is ‘petite‘ (I’m only 1.55m), she has beautiful lines on her face, white long hair and the most sparkling eyes. Dressed in white with a pair of Bensimon, she looked amazing. Anyway, to cut a long story short (the long one with photos of her shop and inspiring studio will be for when I get back to work next week), we talked and we agreed to work together… So good things are going to happen on BODIE and FOU soon, very good, nice things and right now, I’m feeling incredibly lucky not only to have met such an exceptional woman but also to know that this is not the end. And I can’t thank enough Steve who waited and looked after Mila for 2.30 hours while I was talking with her. génial, je suis ravie pour toi!! je me réjouis de découvrir les fruits de votre collaboration! The way you describe this person (that I did not know) the more curious I become of seeing her work, her shop and her ideas on decorating!I would love to see the pictures of her house. Looking forward on what comes…. What a lovely story! Amazing. A meeting which was meant to happen. Looking forward to the suite. Je ne la connaissais pas cette fameuse Madame Morabito! Et je ne regrette pas une seconde d’avoir jeté un coup d’oeil sur votre blog! J’ai trouvé le lien via Vosges Paris. What’s a great post!!!! I’m so happy because of your meeting with Jacqueline Morabito. You know that I could imagine how much it means to you :-) I’m crossing my fingers for you cooperation with this amazing woman!!!! Great post and good luck !!! How wonderful – Jacqueline is a real hero of mine also – you capture her so brilliantly and I can’t wait to see more pictures & read more about your meeting – just lovely.